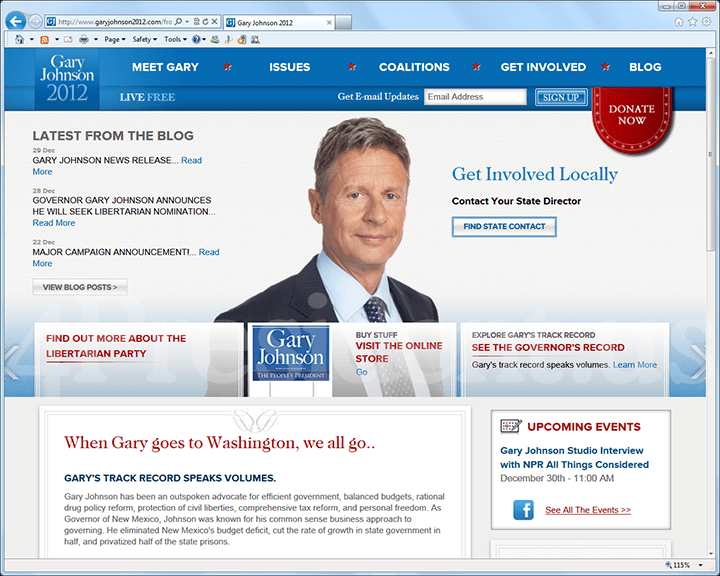 December 28, 2011, Santa Fe, NM -- At a morning news conference in the Rotunda of the New Mexico State Capitol, former New Mexico Governor Gary Johnson today announced that he is seeking the Libertarian Party nomination for president. "Today I am announcing that I will seek the Libertarian nomination for President of the United States. The Libertarian Party nominee will be on the ballot in all 50 states - as he was in 2008, and I will offer a principled alternative to the Republican and the Democrat. "This was both a difficult decision - and an easy one. It was difficult because I have a lot of Republican history, and a lot of Republican supporters. But in the final analysis, as many, many commentators have said after examining how I governed in New Mexico, I am a Libertarian -- that is, someone who is fiscally very conservative but holds freedom-based positions on the issues that govern our personal behavior. "Frankly, I have been deeply disappointed by the treatment I received in the Republican nomination process. I had hoped to lay out a real libertarian message on all the issues in the Republican contest. The process was not fair and open. "This election is about issues larger than party or personal ambition. The future of our country is at stake. "I believe this election needs a true libertarian voice. While Ron Paul is a good man and a libertarian who I proudly endorsed for president in 2008, there is no guarantee that he will be the Republican nominee. "My Agenda for America, a libertarian agenda, is clear. It is not at an agenda you will hear from any other candidate or party. - I want to enact the Fair Tax to stimulate real economic growth and job creation. - I oppose expensive foreign wars in places like Libya and Afghanistan where our national interest is not clear. -I want to cut the over-regulation of our families, our businesses and our lives. - I support marriage equality for gay Americans, as required by the Constitution. - I support the legalization of marijuana, which will save us billions and do no harm. - I demand a government free of special interest influence, crony capitalism and corruption. "I am confident this agenda will resonate with the American people because it actually reflects the true beliefs of a clear majority of Americans. "Sadly, neither the Republicans nor Democrats will offer this agenda to the American people. The Republicans talk about cutting spending and taxes but insist on government regulating our personal lives. The Democrats support more liberal social policies but they will tax and spend and borrow us into bankruptcy. America needs a third way. "I know first-hand that my governing philosophy works because of my experience as a successful two-term governor, elected and reelected as a Republican in a Democrat state. I know how to create jobs because I have created jobs. My record on job creation is superior to Barack Obama, Mitt Romney or any other candidate. I successfully governed as a Libertarian in everything but the name, and I am running for president as a Libertarian. "If I earn the Libertarian Party nomination, I will be on the ballot in all 50 states. I will not be held hostage to a system rigged for the wealthiest and best-known candidates in a handful of states who happen to have early primaries. And most important, we will offer a political "home" for millions of Americans who are not finding one in the current political establishment or its candidates. "I am excited by this challenge. I am liberated. And I am committed to shaking up the system as it has never been shaken up before. The tired old two-party system has failed America. When I read in the Wall Street Journal that Mitt Romney refuses to rule out an ad valorem tax I realized the American people must be offered another alternative. "America is ready for a President who will restore common sense to our fiscal and foreign policies and get government out of the boardroom and the bedroom. I believe the American people will see that a credible Libertarian candidate for president is the real path to liberty, economic growth, opportunity, and a government that is put into its proper and limited role. "In a recent national poll 63% of Americans said they wished there was a third choice for 2012. There is another choice, and I intend to educate the voters about what we offer America. Together I am convinced we can make history and restore America to greatness."